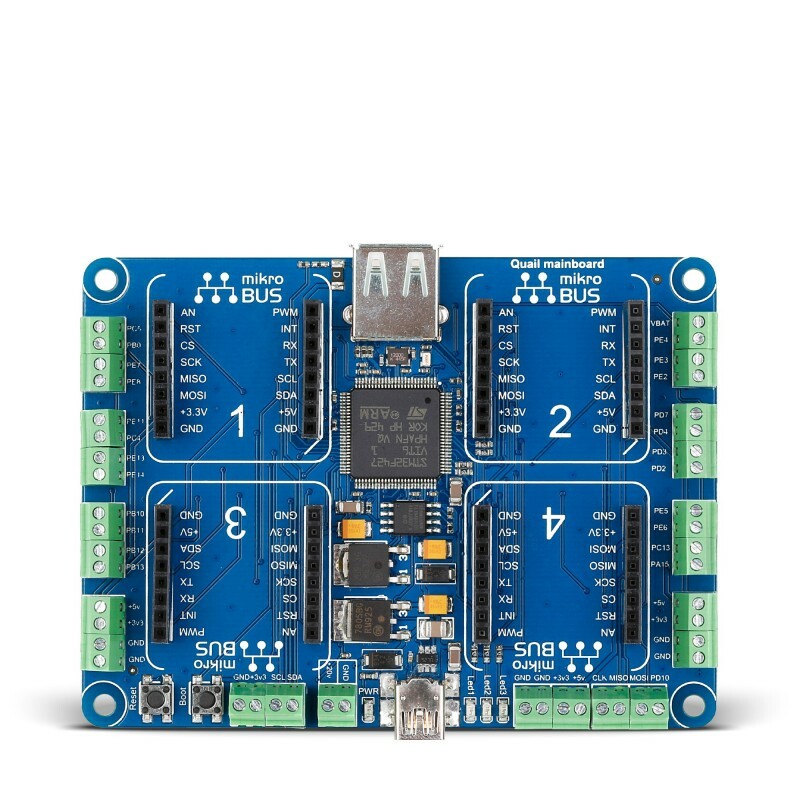 Quail is an STM32-powered development solution for building hardware prototypes with click boards and C# managed code. It brings together click boards and Microsoft’s .NET Micro Framework for embedded devices (NETMF). 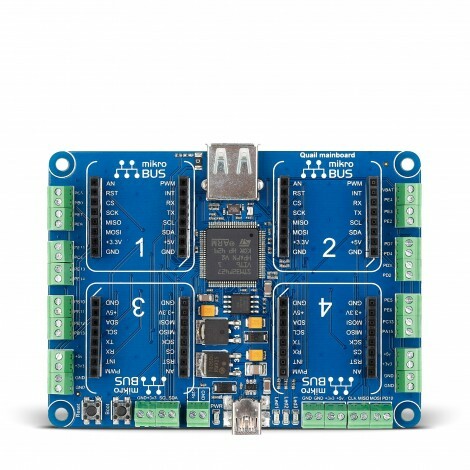 Write code for your Quail projects in Microsoft Visual Studio (free in the community edition); drivers for individual click™ boards are provided by the MikroBUS.NET team. Hardware-wise, Quail has 4 mikroBUS™ sockets for click board connectivity, along with 24 screw terminals for connecting additional electronics and two USB ports (one for programming, the other for external mass storage). The board runs on a 5V power supply. Quail is produced by MikroElektronika, but the idea and design of the board was done by MikroBUS.NET, a team of software and hardware professionals from France. The core idea behind Quail was to empower embedded developers with the same modern tools and technologies used by those who develop desktop applications. On the flip-side, Quail also allows desktop .NET programmers to delve into the world of hardware development, with ease. For more information about the MikroBUS.NET team, visit their site. The page also contains a detailed getting-started guide. Quail requires three pieces of software to run. 1. Microsoft .NET Micro framework. Open source platform that enables you to write managed C# code for embedded applications. 2. Visual Studio Community 2013 [visit site]. A full-featured free cross-platform IDE from Microsoft. The MikroBUS.NET team is constantly churning out new NETMF-compatible drivers for click™ boards. So far they’ve covered about 50 clicks. Once you installed all the required software you can find individual click board drivers on the official MikroBUS.NET webpage. The website also contains a detailed walkthrough on how to start a project in Visual Studio, include the necessary drivers and reference the needed assemblies in your source code. Applications Quail allows desktop .NET programmers to delve into the world of hardware development, with ease.